What do you do when the demand for books in your language outstrips the supply? Write and publish your own! Come celebrate Seattle's community-created Somali alphabet book, "Baro Af-Soomaali," at a free public event from 5:30 p.m. to 8 p.m. Friday, Feb. 9at the NewHolly Gathering Hall, 7054 32nd Ave. S.
Everyone is welcome. Food and beverages will be provided and books will be available for purchase and signing. The innovative collaboration involved five families who live in the NewHolly neighborhood, The Seattle Public Library, Seattle Public Schools, Seattle Housing Authority (SHA), the Somali Family Safety Task Force and local poet Mohamed Shidane. The book was published by Applewood Books, and will be distributed by Ingram Content Group. Deputy Mayor Shefali Ranganathan, Library Programs and Services Director Tom Fay, Schools Superintendent Larry Nyland and SHA Executive Director Andrew Lofton will join the festivities and honor the book's diverse project team. 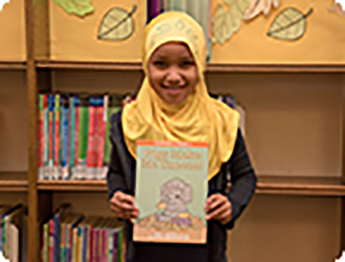 The children's board book centers on Somali language, community and culture. "Baro Af-Soomaali," which means "learn Somali" in English, gives Somali parents the opportunity to share their culture as they teach their young children. The book, which was written during the summer of 2017, grew out of the realization that Somali language board books simply weren't available. The Somali publishing industry is comparatively small, few distributors handle Somali books and the stock of books readily available for purchase is very limited. The Library has approximately 200 books in Somali. Less than half are children's books, and there are very few board books. "The Library has a deep commitment to community engagement and this project was the result of listening to the Somali community," said Marcellus Turner, the Library's executive director and chief librarian. "The community wanted family engagement opportunities and more books in their language. Collaborating on a Somali book responds to those needs in a fun way, builds a sense of community and expands our vision of how to serve the public. As far as we know, this is the first and only project of its kind." Four book creation workshops, which were attended by five Somali mothers and their 13 children, were held in a meeting room on the NewHolly campus. First, the families visited and shared a delicious Somali meal and tea. Then the group discussed the layout, assigned a series of letters to each family and began creating artwork. The families brought in their own valued items rooted in Somali culture to be photographed for the book. After several rounds of edits, the final draft was submitted to the publisher in November. The first print run of 1,000 books will be distributed to the community partners and each participating family will get five books apiece. The book will be available in print and as a free PDF download from the Library's website this spring. It will also be marketed and distributed to libraries, schools and retailers nationally and internationally by Ingram. The book was funded in part by The Seattle Public Library Foundation, the Bill and Melinda Gates Foundation, and Race to the Top Deep Dive 3 with Puget Sound Educational Service District and Community Center for Education Results. For more information, visit www.spl.org/baroafsoomaali, call the Library at 206-386-4636 or Ask a Librarian.